Refinishing your hardwoods is a DIY project you need to understand fully before undertaking. Refinishing your floors isn’t a quick DIY project. It usually takes longer than a weekend, so be prepared to live with dust and fumes for a few days longer. As with any home renovation, patience is key. Doing the right preparations beforehand will help things go smoothly. Using a floor sander (orbital or drum) is tough on the body, so tag team on the sanding. 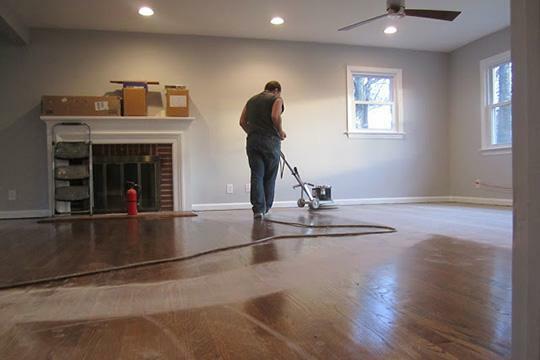 Before sanding your floors, determine if they can be sanded. Because true hardwoods are solid wood, they withstand the loss of the top layer through sanding. Laminates will be ruined if sanded. It is better to just re-seal and buff engineered flooring. Prepare. Make sure the floors are clean of all dirt and wax. Remove all furniture, seal off doors, vents, outlets and light switches. The object is to control dust from getting out of the room (and there will be a lot of it!). Sand. Start with 60 grit sandpaper and work your way up to 120 grit for the final sanding. Work in a straight path along a wall in a semi-circular motion. Always keep the sander moving to avoid creating uneven grooves. Clean Up. Learn to love the vacuum because your diligence in cleaning after each sanding determines if your finish is blemish free. Frequently check the vacuum filter for clogs. Damp mop floor thoroughly when done. Finish. Work with a brush when applying sealant around the perimeter and a lamb’s wool applicator for the rest of the floor. Overlap the application with the area worked with the brush. Allow 24 hours to dry. Buff and vacuum before applying second coat. Apply stain in the same manner as sealant. Finish with a couple of coats of polyurethane. One of the biggest decisions you have to make for this project is which type of sander to choose – orbital or drum. Orbital sanders take longer to do the job but are easier to use. Drum sanders are harder on the floors but they get the job done quickly. Both have a mind of their own, so know your skill level when attempting to operate them. If working on other renovation projects, save refinishing the floors until last. The finish takes longer to dry in humid and rainy weather. Wait for dry weather. Remove adhesive from a previous flooring with glue remover, rather than sanding. It is tough to sand off and can stain wood. Practice with your sander on a sheet of plywood to get consistent with your strokes. Use an edging sander to smooth out sanding swirls around the walls. Hand sand tight spots like corners. Use a hardwood floor attachment on your vacuum to avoid scratching. Allow dust to settle in room before removing plastic sheeting and doing your final cleanup. When using oil based sealant or stain, use a respirator. Odors from polyurethane can linger for a couple of days so leave plastic up over doors if the fumes bother you. Keep Off My New Hardwood Floors! Let the floor dry completely before moving furniture back into the room. It’s a good idea to avoid shoes, bare feet and pets getting on them for the first 48 hours. Until then, don a pair of sunglasses, wear your socks and slide around your refinished floor like Tom Cruise in Risky Business. Clothing is entirely up to you! From orbital sanders and floor edgers to fans and shop vacuums, our expert staff is always on hand to help with your DIY hardwood refinishing. For even more helpful info to get you started, check out our blog, How to Re-Finish Your Hardwood Floors to Perfection. As always, if you have any questions about pricing or how-to’s, don’t hesitate to contact us. Stop by our store — we’re open seven days a week.